*Balsamic vinegar is not legal on the official SCD list, but with the note that real balsamic vinegar is fine, it's just that most of what you get here in the US is not actually balsamic vinegar. I'm pretty sure that what I have is real and my family seems to tolerate it fine. If you are concerned, you could either use all apple cider vinegar, or there are recipes for SCD replacements for balsamic vinegar around. 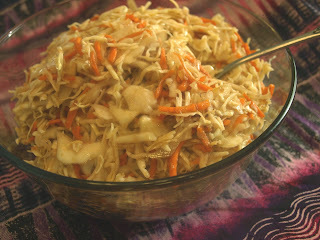 Shred the cabbages in a food processor (I use the thin slicing blade), or finely cut by hand. Grate the onion and carrot. If using the celery, slice thinly and add to the veggies. Place all the veggies in a large bowl. Combine the ingredients for the dressing and pour over the veggies. Mix in the cilantro if using. Taste and add salt if needed. This is the first recipe I made with my new Cuisinart, and it's delicious! I used just one head of cabbage and still got a huge batch. I just need you to know how incredibly amazing every single one of these recipes is. I've probably made about 20 of them, and there hasn't been a bad egg in the entire bunch. You have made GAPS eating absolutely easy and delicious. And I even have kids and a picky husband! THANK YOU!!!!! Thanks for letting us know Mandi, that was the reason we started this, to make GAPS easier!